Our world is faster and louder than ever. The result is a fragmented, cacophonous experience that can feel meaningless. 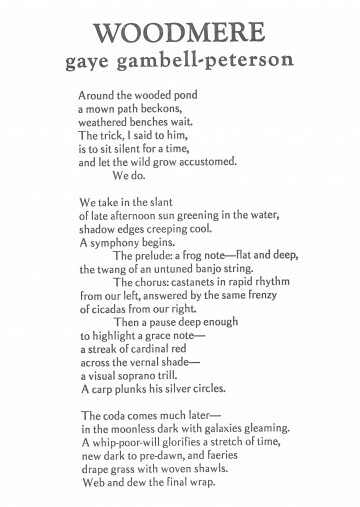 But gambell-peterson insists it’s possible to make sense of things, if only we’re willing to “sit silent” long enough to “let the wild grow accustomed.” There is, of course, the need for the creatures in this poem to become comfortable with their human visitors, but there is also the need for the humans to quiet themselves. It’s only after this essential first step that the speaker can begin to impose an order on her observations of the landscape, in this case the musical structure of a symphony. From random sounds, meaning is created; whether we sit by a wooded pond or on a bench downtown, it’s what we do. The contrast of thin and thick strokes in Balham mimics the “there and gone again” elusiveness of the creatures and forces that create this poem’s sounds. It also gives the page a lightness that matches the poem’s tone. Goudy Old Style is weightier, but not so much as to capsize the balance of the page.